Marjorie Spiller would today be described as a complex character. Her life included highs and lows. An actress and pilot, she accomplished much, yet her final two years reveal she suffered crippling self-doubt. Lettice Curtis in her book about the ATA, ‘Forgotten Pilots,’ failed to include Miss Spiller in the list. To be fair to Lettice, in addition to her own memory, she had to rely on other ex-ATA personnel to help her to record every pilot. Thus a few individuals have been truly forgotten. Were it not for Flight magazine and The Aeroplane magazine, who recorded Miss Spiller’s ATA service in her obituary, this fact would now be lost to history. Marjorie’s start in life benefited from being born into a middle class family. Her paternal grandfather was a Barrister. Her father William was privately educated. He qualified as a member of the Institute of Mechanical Engineers in 1901. 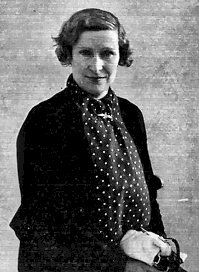 Phyllis Marjorie Spiller was born in Streatham, London on 23 November 1897. Soon after, her parents moved to Burgess Road, Bassett, Southampton. By 1899 her father William was manager of a Bicycle Agency in Above Bar shopping area. An unsavoury court case that same year falls into the category of ‘you couldn’t make it up.’ It placed the Spiller family on the local newspaper front page. A former employee smashed William’s shop window. He accused Spiller of inappropriate behaviour with his wife and declared he wanted to do William great harm. The woman worked as domestic help to Mrs. Spiller. In court, William denied the accusation of an extra-marital affair. The sequel to this was a dispute between the aggrieved window-smashing man and his wife, the couple seemingly had separated. Shockingly, in retaliation she broke into his home, drowned his cat in the boiler and suggested he boil it for soup. The whole affair must have greatly embarrassed Marjorie’s mother. What effect did it have on her marriage? After the court case, William set up in business in Southampton as a Consulting Engineer to the marine and automobile industries. He designed and built vehicles. Marjorie was an only child. She was sent to a small private boarding school in Henley-on-Thames. During this time her parents moved to Manchester where William became Manager of a car factory. What sort of home life Marjorie had, we will never know. But we do get an insight into her character through her correspondence with Pauline Gower during WW2. Marjorie Spiller the actress. Also known as Margery Spiller. Image courtesy of Terry Mace – A Fleeting Peace. Pre-war, by the age of 32, Marjorie had established herself in theatre-land as an actress and singer. In 1930 she toured Britain as a cast member performing a murder mystery play laced with comedy. “Murder on the Second Floor,” received good reviews. Here, she could enjoy the applause and admiration of the audience. Her photograph appeared in Sussex newspapers, where she’d set up home. In 1931 Marjorie, also known as Margery in theatrical circles, again toured the country. She took centre-stage as the female lead in the farce, “A Little Bit of Fluff”. She played the wife of a philandering husband. Marjorie got the flying bug in 1935 and changed her life. She gave up acting and learned to fly at South Coast Flying Club, Shoreham. 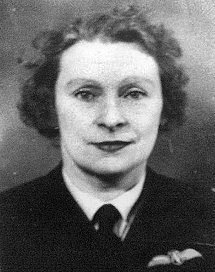 Miss Spiller gained her ‘A’ licence in October 1935. On that licence she gave her year of birth as 1905. She’d shaved 8 years off her age. It was common for actresses of yesteryear to fib about their age. This may have been Marjorie’s motive. 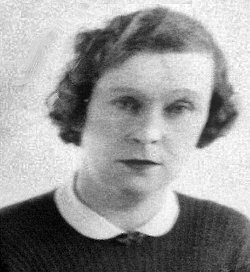 Marjorie Spiller ‘A’ flying licence photo. Image courtesy of Royal Aero Club Trust. Marjorie became ‘Woman of the Week’ in one newspaper. She’d volunteered to fly aircraft to Spain for £150 a trip, to help the rebels in the Spanish Civil War in their fight against General Franco. Her reason wasn’t entirely altruistic. Getting her ‘A’ licence had left her short of money. Learning to fly was not cheap. Her next ambition was a ‘B’ licence. She was prepared to fly anything to anywhere to get the necessary flying hours. In 1937 Miss Spiller gained her desired ‘B’ licence at Shoreham. This meant she was qualified to carry passengers and earn a living as a commercial pilot. She rounded off a successful year by flying to the club in a Puss Moth, once owned by the Duke of Windsor. In 1938 she gained her flying instructor’s endorsement and took her first instructor’s job. In fact, it could be said that as a pilot she had finally ‘arrived’. Any euphoria she felt was to be short lived. For in January 1939 tragedy struck. Her mother died. It devastated Marjorie. Later, her nerves were so affected she gave up her Flying Instructor’s job at Eastbourne. The circumstances of Eliza Emily Spiller’s death are not on record but during the war Marjorie revealed it to Pauline Gower. She claimed her mother took her own life. Pauline, who similarly suffered the loss of her own mother to suicide, would show sympathetic understanding towards Marjorie. The war started in September 1939, Marjorie was living at her late mother’s house in Hurstpierpoint. She’d taken in lodgers to help financially and joined the ARP as an ambulance driver. In December the Air Transport Auxiliary announced the formation of a women’s section. Marjorie immediately wrote to Pauline Gower who was to become Commandant. 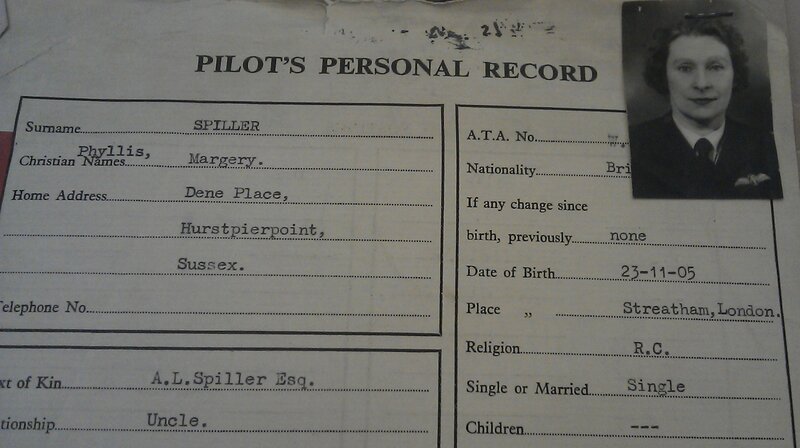 After many false starts, delays and some acrimony, Miss Spiller did join ATA in March 1941. Proof is provided by her conversion course training log and personal file. The fib about her age continued, because she had to provide her flying licence as part of the application process to join. Marjorie Spiller’s ATA personnel file 1941. She also called herself Margery. Image courtesy of Terry Mace of A Fleeting Peace website. On paper, Marjorie should have been the ideal candidate for Pauline’s team. A commercial pilot and Instructor she should have oozed confidence. She didn’t. Her mother’s death may have affected Marjorie far more than she was ready to admit in her letter to Pauline. Three months after joining, her pecuniary past caught up with her in an embarrassing manner. Pauline can’t have been pleased to have been inadvertently drawn into it. Marjorie’s time with ATA was running short. Forced to leave through ill health, she died soon afterwards in May 1942, age 44. She had cancer. Her illness may explain why she twice, in December 1941, abandoned flights north in a Hurricane and a Master. Having landed at Sealand on both occasions, she asked the RAF to complete the flight for her. She claimed she was frightened of the aircraft. She also gave personal reasons of being short of money and laundry. The ‘laundry’ excuse is extraordinary for that era, an embarrassing thing for any woman to admit to a man of rank. Trivial too, given that there was a war on. 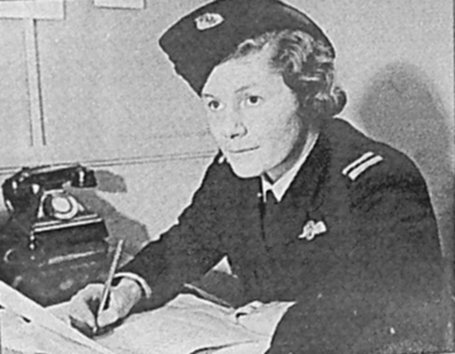 Pauline Gower, Commandant of Women’s Section Air Transport Auxiliary. Image courtesy of Michael Fahie. The correspondence between Pauline Gower and Marjorie Spiller is at times not an enjoyable read. But it is illuminating and valuable on three accounts. Firstly, it demonstrates Pauline’s remarkable skills in people management. Not an easy job at times. As Marjorie wrote, ‘You are the right person in the right job.’ And she was. Secondly, it illustrates what an arduous job it was being an ATA pilot. Thirdly, it suggests that Marjorie was emotionally and financially insecure, and sought the approval and friendship of her idol. She was perhaps, not up to all aspects of this challenging job. But she was keen to be part of an organisation that gave her some status and respect within her extended family. One can’t help but wonder how life had treated her. 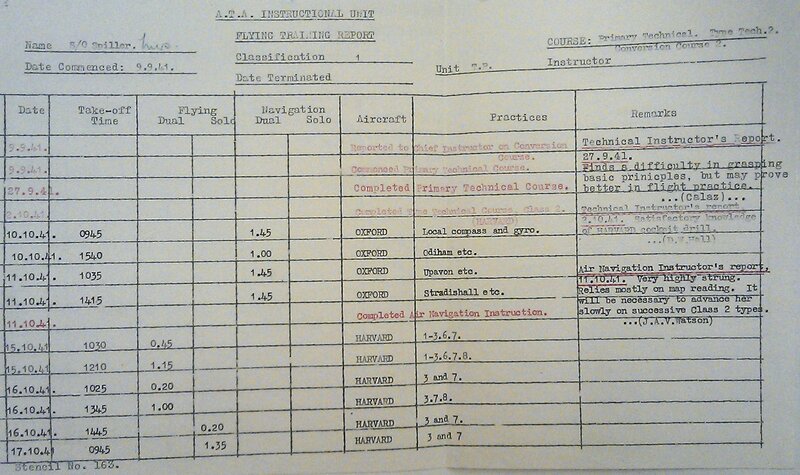 Marjorie Spiller’s ATA training log of aircraft types with comments by her Instructors in 1941. Image courtesy of Terry Mace of A Fleeting Peace website. Marjorie’s ATA flying time totals to 109 hours 40 minutes. Most of this was in Tiger Moths, then her conversion course training on Magister, Tutor, Master, Harvard, Hart, Hurricane and Battle, and subsequent aircraft delivery. Follow this link to Terry Mace’s Fleeting Peace website and scroll down to find Marjorie Spiller. There you can read the transcription of the correspondence between Pauline and Marjorie. My special thanks to Terry for his help with Marjorie’s ATA record.